Any ancestors from the southeast portion of Florida? The Historical Society of Palm Beach (the county is Palm Beach – with cities such as Lake Worth, West Palm Beach, Delray, etc.) has placed a large collection of some vintage images of the county of Palm Beach over the decades. Your ancestors may not have lived there, but a good possibility they may have vacationed in the area. Any relatives even in neighboring counties such as Martin, St. Lucie, Broward, Dade or Okeechobee may have shopped or visited in Palm Beach County. Besides images (from post cards and photographs) the society also has many other records you can research online. Using the check-off list to the right you can expand or narrow you search, which would include images of artifacts and documents. One of the most famous places in Palm Beach is The Breakers Hotel which faces the Atlantic Ocean. It began in 1896 as the Palm Beach Inn, built by Henry Flagler. Its name was changed about 1900 to The Breakers because it did feature hotel rooms ‘over the ocean breakers’. The wooden hotel burned to the ground in 1903. It was rebuilt as a wooden structure again in 1904. 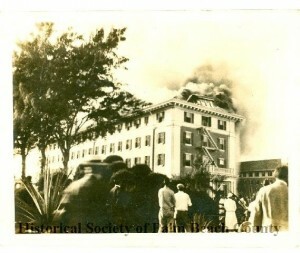 Another fire on March 19, 1925 destroyed the resort hotel. It was rebuilt using concrete along with the finest furnishings available. The Breakers has remained the elite of all places to stay in Palm Beach. However during World War II it did serve as a military hospital, so you just might have had a relative who was cared for at the Breakers / hospital in the 1940s. There are numerous other scenes of everyday life and places across Palm Beach County, not just the resorts and hotels. Items date back before 1900 and through most of the 20th century. Even locations to the north, west and south of Palm Beach can be found in its archives. Some of the records and even photos are not in digital format yet but are listed in the archives. If there are any of special interest you can contact the Historical Society of Palm Beach Co.
Photo: The second Breakers Hotel burning in 1925.